Inspired by forms and patterns found in nature, Sylvi Alli transforms a variety of materials - sterling silver, gemstones, fossils, copper, leather - into wearable works of art. Her background in visual arts and music informs her creative process and she employs a variety of metal smithing techniques to create her pieces under the name 'LunarMuse'. Exploring the balance between rustic and elegant, and playing with unexpected combinations of organic textures and forms, Sylvi creates handcrafted jewelry that is unique and out of the ordinary. Arabesque is the creative partnership of silversmith Joshua Haiman and writer/illustrator Holly DeFount. Holly’s fine art background paired with Joshua’s smithing and jewelry design makes for a unique and dynamic fusion of their arts. Arabesque’s style reflects the elegance of decorative art found in historical architecture, sculpture, fabric and ornamental design, as well as the graceful iconic pose in ballet. We rely on ethically sourced materials including recycled and fair-mined metals, and practice environmentally responsible principles both in the studio and out. We are committed to fostering a culture of collaboration and interdependence centered on the arts. ﻿My joy is in working with fine, found, and recycled materials to form unique, wearable sculptures. I create pieces that emphasize texture through metal crochet, weaving, multiple patinas and other adventurous techniques. My background in painting and printmaking also often come into play in the tumultuous, wonderful marriage of practices that form my art. I use traditional fabrication techniques in the production of my jewelry, a process that makes each piece unique. I work with shapes and dimensions to create interesting spaces. I am influenced by the idea that opposing forces create equilibrium. I find myself drawn to elements of architecture and industrial space, as well as the patterns and forms of nature. I strive to maintain a balance between the polar forces I reference in my work. 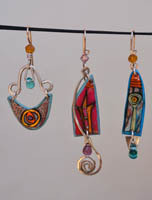 Shael Barger is the designer and metal artist creating under the name Dakotah Designs. She continually explores and refines her vision through use of metal, primarily gold and silver, and lapidary, creating texture and images. She combines fabrication and inlay work with elements she has cast directly from nature _ twigs, leaves, pine cones among others. She also etches designs into the metal, introducing movement and dimension- physical and implied- into her work. For Shael, the stones speak _ they tell her how they wish to be combined with other elements -because it is important that each piece tell a story, that they become sagas in stone and metal. David M Bowman Studio is a father and son workshop designing and creating jewelry, table accessories, tables, and wall art in patinaed brass and copper. Their work includes many perennial designs but is always changing and adding new styles, techniques, and ideas, while retaining a focus on hand-fabricated and patinaed metal. David and his son Reed do all the work together, taking inspiration from natural forms and colors, artwork and architecture of all periods. Living and working in Berkeley for more than thirty years, their work particularly relates to the styles of the East Bay, from the people to the Craftsman architecture. I am interested in texture and pattern. My metal work is fabricated by hand, using the surface techniques of chasing and engraving. These processes, along with a patina application, are an integral part of creating depth and contrast. This Lacquered Paper process begins with design of a collage consisting of various kinds of paper (Origami, foils, etc.). Each original design is then detailed with India Ink and acrylic paint. Finally several layers of a lacquer finish are applied with a brush. It is a laborious process with results that have a nice depth and richness. Enjoy your original Jennifer Cole. Please keep out of sun and high heat. 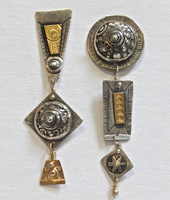 Jill Gibson was born in California, studied painting at the Art Student’s League NY in the late 60’s, explored bas relief sculpture using clay and concrete, & recently began sculpting jewelry using metal clay. Metal clay was developed in the 1990’s & consists of powered bronze, copper, or steel suspended in an organic binder and then mixed with water. 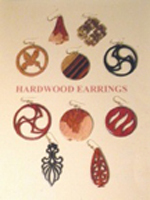 Jill develops her pendants and earrings through molding, inlaying, shaping & carving. The dried clay is then fired in a kiln where the binder burns off and the metal sinters into solid, pure bronze/copper/steel. 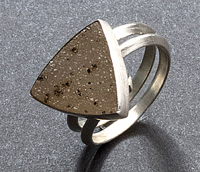 Jill favors combining metal clay techniques with traditional metalsmithing techniques to arrive at her designs inspired by nature. An interest in personal adornment and a strong background in visual arts has led me to jewelry design as a means of personal expression. Weaving offers me both the interesting challenge of developing an eye catching surface design that uses the movement of light and color within a defined area, and a meditative pleasure in the construction of the jewelry. These are definitely pieces for the confident woman who is not afraid to be noticed. 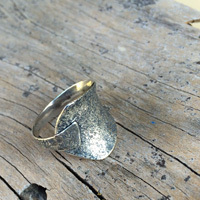 My jewelry is fabricated out of sterling silver, 14k gold and gold-fill. The metals are roller printed leaving textures from rice paper and fabrics. Pieces are then formed by hand sawing and delicate soldering. Lost wax casting is another process I use to make limited editions. I've been making jewelry for 18 years. I find that my work is constantly changing because I have so many ideas and enjoy learning new techniques. Please enjoy my heartfelt jewelry made for everyday living. I enjoy creating jewelry to adorn and accentuate the beauty and femininity of women. As a dancer and teacher of the Nia technique, I am inspired to design jewelry that can be worn gracefully in movement. 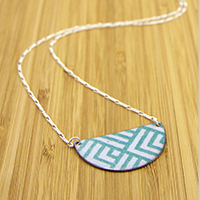 I think of jewelry as a statement revealing a woman’s unique style and personality. I received my training at the Richmond Art Center and the Revere Academy in 2000. Diana was born in Bogota, Colombia. She received a Bachelor of Arts in Biology from Duke University and then returned to Bogota to work at the Andes University. While doing biological drawings for the University, she developed an interest in the arts and began studies in drawing and painting at the David Manzur Academy. After moving to the U.S. Diana continued to develop her art in numerous workshops. It was in one of these workshops that she became intrigued by three-dimensional art and now works mostly in sculpture and jewelry. Diana lives in San Rafael, California and is active in various art organizations. I enjoy the creative process of transforming an eclectic collection of materials into beautiful and intriguing jewelry. 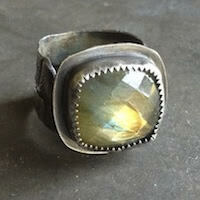 I work with sterling silver and bronze and incorporate unusual stones, fossils, and found objects like antique buttons. I enjoy taking things that are interesting and have a history and transforming them into modern jewelry to wear, and even hand down to the next generation. I follow my intuition and creative process, using a variety of metalsmithing techniques. 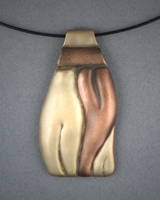 The resulting pieces are unique, hand wrought, bold and elegant. I love the dual nature of metal: rigid and unyielding, but with the proper tools and techniques it can be coaxed into fluid forms. Iím particularly drawn to the techniques that emphasize those qualities such as forging. Another method is fold forming in which sheet metal is folded, hammered, and unfolded to generate 3D forms. Fold forming has helped my work to achieve a more spontaneous, improvisational quality. 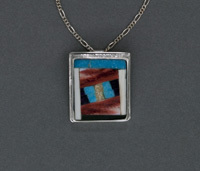 Enameling (fusing glass to metal) is the other major branch of my work. When I'm not making a things out of metal, I teach others to, primarily at the Richmond Art Center. 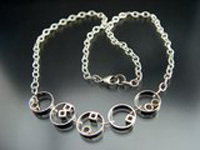 Much of my work focuses on creating textured gold and silver jewelry. I use a variety of processes including etching, corrugation, heat treatment, hammering and roller printing with lace and paper. Gold is often added through the Korean process of Keum Boo, which bonds thin layers of 24 karat gold to a silver surface. My inspiration comes from a variety of sources. Outdoor photographs I have taken are used to create etched images. 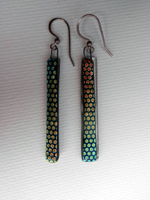 Simple geometric shapes become earrings and Japanese paper is captured inside resin to add color and design to the metal. I see it as cheeky. Cheeky Glass Celebrations and Curiously Useful Products. In art school, I was drawn to the playfulness and color of mobile artist Alexander Calder. Initially, the use and brightness of his colors drew me to silk screening. Eventually, I had an "Aha" moment about the color possibilities in metal jewelry, and began creating small, bright 'sculptures' for the ear that would artfully interact with the face of the wearer, and was on my way to my own craft. Once I realized the importance of craft and art to me, I could see their importance to everyone, even those who don't fully realize it. I put my personality in each piece, transmitting as much humor, affordability, color and intriguing design as I can. NOMAglass is the collaboration between father and son artists Bill and Michael Spiegelhalter. 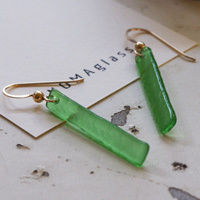 Our work centers around using glass recycled from old windows and wine and beer bottles, transforming them into distinctive jewelry and housewares that are simple, organic and elegant. Everything we make is individually hand-cut and shaped before being kiln-slumped, creating unique variations in each piece. Fused glass pendants by Gina Papen. Dichroic glass is coated with a thin metal oxide and layered before firing in a kiln at 1600 degrees. Originally from San Francisco, Gina now lives in Berkeley. She has a BFA from Parsons School of Design in New York. 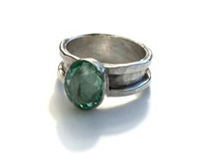 Originally from Tucson, Arizona, Sharla Pidd is a rock collector turned silversmith. 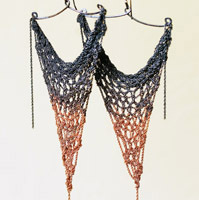 She started making jewelry in 2008, selling her creations as a street vendor in San Francisco. Since then, Sharla has presented her work in Galleries and Art Fairs in the Bay Area, and sells her work on her website. Sharla received her education in jewelry design and fabrication from the Sharon Art Studio, The Revere Academy, and through apprenticeships with Sam Patania in Tucson and Taber Studios in Berkeley. Today, Sharla works out of her studio at The Compound Gallery in Oakland, California. Leah comes from California's culturally rich Bay Area. She grew up with a passion for artistic beauty and completed her formal education with a bachelor's degree in studio art. Leah finds the inspiration to design and create her jewelry in the idea of "wearable art." The notion that one could capture the softness of nouveau, the clean lines of deco, and the primal nature of humanity in her lines of jewelry served as a catalyst in the creation of her unique company, Fossi Baht. Except for a few forays to the Rocky Mountains and the Pacific Northwest, Aisling Svennungsen grew up in New England. 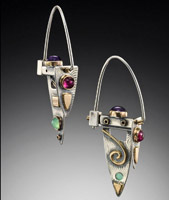 After graduating from the Rhode Island School of Design in 2012, she was a resident artist at the Sitka Center for Art and Ecology in Otis, Oregon, and then established herself as an independent jeweler in Northern California. She launched Moss Follows, a collection of crocheted jewelry inspired by explorations of landscapes, seascapes, forests, and Earth’s seasonal transitions. Her wearable art pieces invoke a sense of wonder and enchantment. Born and raised on a New England island, I graduated from MassArt in Boston with a BFA in Metalsmithing, and moved to Oakland in 2012 to pursue my intuition’s direction. Trips to Penland, and the beauty of the natural world fuel my art. Using forming tools to bring sheet metal into another dimension is the most satisfying set of methods and materials that I have found. With interests in historical metalsmithing and what's beyond this reality we were taught to live in, the result is this question for me to pursue: Can metal rise to another plane, where latent energies are brought to life? I have a BFA in Fine Arts from Washington University in St. Louis, MO where I studied design under the late Howard Jones. My background and style were born out of the Bauhaus ﻿﻿tradition﻿﻿. I work in sterling, gold and gold fill ﻿﻿with ﻿﻿a love of simplicity and form. I use traditional fabricating techniques, allowing the materials to express themselves as limited editions or one of a kind pieces. Sarah Williams was born and raised in the San Francisco Bay Area of California. Having grown up in an artistic household and community she was encouraged to explore many avenues of art. Sarah attended the University of California at Santa Barbara where she earned her Bachelor of Arts degree in Studio Art. After graduating college, she spent several years traveling and painting around the world. Through her travels she cultivated inspiration for her design aesthetic within her medias of painting and jewelry design. _Iris Willow makes handmade enamel jewelry in her studio in San Francisco. Her colorful jewelry adds a splash of color to any outfit. 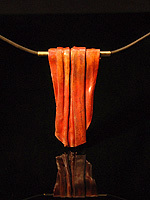 Her pieces begin as copper that she kiln-fires at 1500° to fuse with vibrant powdered glass enamel. 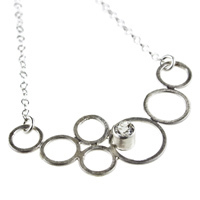 She sometimes integrates screen-printed designs into her jewelry or uses fine silver rivets to combine two pieces together allowing for movement between the pieces. Her jewelry is finished with sterling silver ear wires and chains. _San Francisco-based Eko Wright’s passion for jewelry making comes from the way a torch and tools can transform a sheet of metal into wearable art. Her minimalistic forms created with sterling silver are influenced by the Japanese concept of the elegant, tranquil and imperfect simplicity of nature. 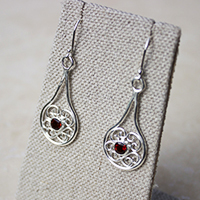 She appreciates both tradition and cutting-edge fashion, and sterling silver is the perfect medium for translating these aesthetics into jewelry. 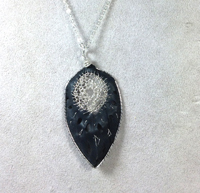 Her work honors nature, the material and the wearer, and she seeks to engender serenity in all her pieces.